VIP Planning: VIP Casino Events is the only casino event company that also offers full service planning and event management. Your casino event consultant will personally meet with you before the event to review your vision of your special event. We will be an integral part to help your event flow smoothly. From designing the floor plan, promoting and marketing your event, sponsorship opportunities, creating an event timeline, to even assisting with the selection of the facility, caterer, and specialty entertainment. VIP Professional Dealers: All dealers are experienced in all the rules of game play, interactive, entertaining, and dressed to impress in formal attire. They are truly what gives you an experience that will keep your guests sharing their memories of your event for years to come. 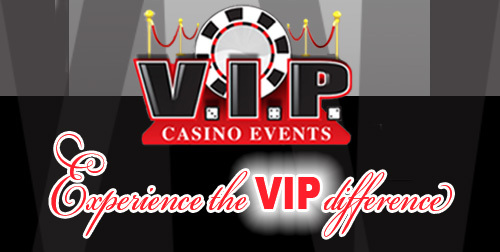 VIP Casino Hosts: These professionals are a VIP Casino Events exclusive and will ensure all guests are completely satisfied with their experience. They will make sure all tables have what they need and even serve beverages and food or anything else they may want to guests as they play. They will also assist with any raffles and prize giveaways. VIP Gaming Equipment/Accessories: Whether you want to play poker, blackjack, roulette, craps, or slots our casino tables, equipment, and accessories are some of the best in the industry. All tables are “High Roller” quality with custom hand made skirting. All cards and chips are casino rated quality or better. All of this and more games offered in customized packages to meet your specific needs and vision for your special event. Interactive game shows: with fully customizable content, with our signature software system that allows everyone to play games like Jeopardy, Are you smarter than a fifth grader, and who wants to be a millionaire and more!. Night at the Races: with video simulcast horse and dog track racing experiences! Green Screen Photo Package: with customized themed backgrounds printed on high resolution branded photos for everyone to take home with them! At our events every guest is a VIP winner!